Keeping My Fossil Fuel in the Ground, Op-Ed in the New York Times, written by Terry Tempest Williams, published March 29, 2016. River Walkers: the Orion Blog, A letter from Terry Tempest Williams sent from the People's Climate March, published on September 22, 2014. The Glorious Indifference of Wilderness, Published in the September/October 2014 issue of Orion magazine. Also from Orion, hear editor Jennifer Sahn and Terry Tempest Williams speak about the writing of this piece. An Open Letter to the Mormon Church, In Support of Kate Kelly &"Ordain Women" + Why Excommunication Is Not the Answer, published on June 13, 2014. Book Bag: Terry Tempest Williams’s Birding Bibles: Forget the Bible or the Torah—for author Terry Tempest Williams, there are two books that matter above all others: her Sibley and Peterson bird field guides. Published in The Daily Beast, March 27, 2013, by Terry Tempest Williams. Read Terry Tempest Williams' tribute to her father published in the Salt Lake City Tribune on June 14, 2012. Terry Tempest Williams writes a column published in the print version of The Progressive magazine. Excerpts from many of the columns are available online. April, 2010, Felon or Folk Hero? The Los Angeles Times published an Opinion piece by Terry Tempest Williams on December 7, 2008, entitled "Oil lays waste to the West". Read it online here. "White flags and cotton grass," by Terry Tempest Williams, was published August 27, 2005, in the Viewpoints section of the Daily News of Bangor, Maine. Same article online at Orion Society web site entitled A Season of Remembrance. Terry Tempest Williams wrote a poem to honor the memory of writer, artist, and naturalist Ellen Meloy, who passed away suddenly in November, 2004. Information about Ellen's books, tributes (including the poem), photographs, and information about the Ellen Meloy Memorial Fund are all available on Ellen Meloy's web site. The third essay in a three part series written by Terry Tempest Williams was published in the July/August 2004 issue of Orion Magazine. The essay is entitled, "Engagement," and is accompanied by beautiful paintings by the artist Mary Frank. You can read it online at the Orion Society's web site. All three essays in this series will be made available in a book, The Open Space of Democracy, in August 2004. The second essay in a three part series written by Terry Tempest Williams was published in the May/June 2004 issue of Orion Magazine. Featuring the Arctic National Wildlife Refuge, the essay is entitled, Ground Truthing - An Open Journal from the Arctic," and is accompanied by beautiful paintings by the artist Mary Frank. You can read this online at the Orion Society's web site. 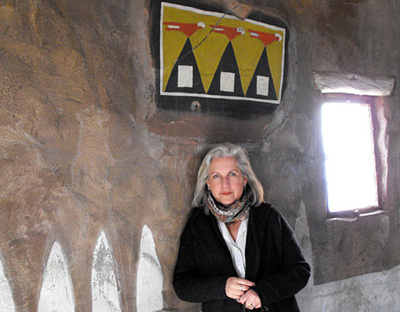 The March/April 2004 edition of Orion Magazine contains the first essay of a three part series by Terry Tempest Williams, entitled, "Commencement." Read it online at the Orion Society web site, with beautiful accompanying paintings by the artist Mary Frank. Read a piece entitled A lesson in engagement from Mary Page Stegner, by Terry Tempest Williams in Writers on the Range, February 17, 2003, in High Country News online. May require login. The essay "A City of Salt and Granite" was published in the 2002 Official Souvenir Program of the Salt Lake City Olympics. Read it here. "Chewing Up a Fragile Land" is an opinion piece in the New York Times by Terry Tempest Williams, February 21, 2002, about what the Bush administration energy plan is doing to our fragile wilderness areas in southern Utah. Another version of this article, entitled "Bearing Witness," with accompanying photos, appears on the Orion Society's website. The July/August, 2002, issue of Mother Jones has an article entitled "Open Season on Open Space," by Bob Burtman, which details the Bush administration's aggressive move to drill oil and gas on public lands across the West. Article entitled "911: In Response to Place," by Terry Tempest Williams, about her experience in Washington, D.C., on September 11, 2001. Article entitled, "A Bow to the Caribou," published in The Wilderness Society's Wilderness Magazine, October, 2001. Terry Tempest Williams was part of a wilderness expedition team who visited Palmyra Atoll. View it online at One World Journeys, Journey to Palmyra Atoll: Rainforest of the Sea. Palmyra Atoll is the last intact marine wilderness in the Pacific Ocean, and consists of 680 acres of land and 15,512 acres of coral reefs, emerald islets and turquoise lagoons. It's also the only nesting habitat for migratory seabirds and shorebirds within 450,000 square miles of ocean. Undeveloped and preserved in isolation just above the equator, Palmyra is one of The Nature Conservancy's most significant land acquisitions. Join the award-winning web expeditions team from OneWorldJourneys.com along with author Terry Tempest Williams, and Patagonia founder Yvon Chouinard as they explore and document Palmyra's coral reefs, rare bird population and fascinating history. Article about Edward Abbey. "He loved to be in our face. Still does, no doubt." By Terry Tempest Williams, Outside magazine, October 1997. Article by Terry Tempest Williams, entitled "Listening Days", on the EnviroArts: Orion Online website. This essay was originally published in the Spring 1997 issue of Parabola, Vol 22, No. 1. The Redemption of Narrative: Terry Tempest Williams and Her Vision of the West, A new book by Jan Whitt, published April, 2016, by Mercer University Press. Terry Tempest Williams leaving U.; critics say school prioritized paperwork over what she taught a generation of students in Utah's wild landscapes, article in the Salt Lake Tribune, written by Brian Maffly, published May 4, 2016. Auction of Utah oil & gas leases spurs author Terry Tempest Williams to (legally) buy lease, article in the Salt Lake Tribune, published February 16, 2016. Read an article entitled "Out of Rwanda: eloquence, forgiveness-- Tutsi in Salt Lake tells stories of fear, death and dogs," by Elaine Jarvik, published by the Deseret News on June 15, 2007. The Lannan Foundation sponsored a reading by Terry Tempest Williams from her book, Mosaic: Finding Beauty in a Broken World and a conversation with Christopher Merrill, in Santa Fe, New Mexico, on May 30, 2007. Christopher Merrill is a poet, non-fiction author, and director of the University of Iowa's International Writing Program. The Lannan Foundation has a podcast of both Terry's reading and her conversation with Christopher Merrill. Read an article entitled The Power of Storytelling: Nature writer Terry Tempest Williams challenges us to take part in spirited conversation and honest storytelling, by Jena Ball, in the June/July 2007 issue of Mother Earth News. Radio Expeditions, a co-production of NPR and the National Geographic Society presented "50 Years on, a Passion for the Wild Endures, by Elizabeth Arnold, on July 26, 2006. In July of 1956, wilderness activists Olaus and Mardy Murie made an expedition to the upper Sheenjek River of Alaska's Brooks Range to inventory the wonders of an all-but-untouched wilderness. Their survey of the region set in motion the effort to protect what is now the Arctic National Wildlife Refuge. Photos, video, and the radio program are available online here. The Wilderness Act 40th Anniversary Wilderness Advocacy Week took place in Washington, D.C., September 18-22, 2004. More than 300 participants from two-dozen states were expected to descend on the nation's Capitol for a week of training, celebrations and educating members of Congress about wilderness protection efforts around the country. Read an article published in the Deseret News September 20, 2004, about the 40th Anniversary Gala dinner at the National Press Club. See the Wilderness Society web site for more information. On August 9, 2004, NPR's Talk of the Nation radio program featured 150 Years of Walden, a story about the 150th anniversary of the publication of Henry David Thoreau's Walden. Terry Tempest Williams participated in this radio program and it can be heard online. Terry Tempest Williams also wrote the foreward for Shambala's special anniversary edition of Walden, with wood engravings by Michael McCurdy. Terry Tempest Williams participated in dedication ceremonies for a new visitor center at the Great Salt Lake Shorelands Preserve. The Nature Conservancy purchased the land to create a wetlands sanctuary for millions of migrating bird. Read an article published June 20, 2004, "Nature preserve gets a new 'nest'," by Donna Kemp Spangler, in the Deseret News. Read an article in the Sunday, March 21, 2004, issue of Deseret News entitled "Reflective Activism," by Susan Whitney. The article is about Terry Tempest Williams' appointment as the Annie Tanner Fellow at the University of Utah's new graduate program in environmental studies, the Lyceum II lecture, and community environmental activism and dialogue. "Surveying the Literary Landscapes of Terry Tempest Williams: New Critical Essays," edited by Katherine R. Chandler and Melissa A. Goldthwaite was published in October, 2003, by the University of Utah Press. Audio interviews on New Dimensions Radio. Article in the Kansas City Star entitled "To singe our souls into action," about Terry Tempest Williams and the RED book tour event, from October 6, 2001. Includes the revised "Strike Moment" essay. Essay entitled "The Great Chorus of Woman and Nature," by Lorraine Anderson, which serves as the introduction to AT HOME ON THIS EARTH: TWO CENTURIES OF U.S. WOMEN'S NATURE WRITING, edited by Lorraine Anderson and Thomas S. Edwards, published by University Press of New England, Spring 2002. This essay outlines a tradition of women's nature writing in the United States in the nineteenth and twentieth centuries. Meeting with students at Mount Holyoke College, 10/24/00 about having Refuge as its common reader. Entitled :Speaking from the Heart: Terry Tempest Williams." Includes photo. Review of Terry Tempest Williams' March, 1996 talk at the University of Tucson, entitled "Piercing the Heart." Article about Terry Tempest Williams' talk November, 2000, at the Center for the American West, University of Boulder, CO. Entitled "Skyearth Letters: Consider the Earth" , by Cherie Staples. Entitled "Getting it Right", a roundtable discussion from Sierra magazine. Prepare for victory today: An eclectic group of environmental visionaries gathers at the electronic roundtable. January/February, 2000. Article entitled, "A Fierce Responsibility," by Stephanie Mencimer, published in Mother Jones magazine, March, 1994, about the public-lands debate, and the clan of one-breasted women. See a more complete listing of articles in the Bibliography section.